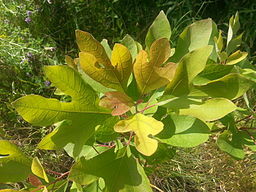 Sassafras (Sassafras Albidum) medicinal herb is a plant that is native to North America and grows widely along the eastern coast of the United States from Florida, north to the Canadian border. It is of the family, Lauraceae and this was one plant that my grandmother constantly spoke about. It was one of her favourite herbs. The legend behind this is that the scent of the tree blown to sea by the wind, enabled Columbus to convince his crew that land was near when they were about to mutiny. Sir Walter Raleigh once had a monopoly on all imports of this herb into Europe, which was one of the first products imported to Europe from America. The common names Ague tree, Saxifrax and Cinnamon wood. The medicinal properties are aromatic, stimulant, diaphoretic, and alterative. The native Americans Indians used it as a spring tonic to cleanse the body of waste material and to purify the blood. This was introduced to the early settlers by the American Indians and they also showed them how to use it. The Indians used the leaves, bark, flowers and rhizomes as herbal medicine. However the root and the bark are most widely used and they possess the same medicinal properties. In regards to herbal smoking the Indians also smoked the dried root for coughs, asthma, lung and bronchial problems. It can also be used to cure tobacco habit. The bruised leaves can be used as a poultice for pain, sprains, and sores. Although the Food and drug Administration banned the use of the essential oil extracted from this medicinal herb for internal use because of its concentrated nature, they never banned the use of the herb in its natural state. However, externally the essential oil extracted from it is used to alleviate pains associated with menstruation as well as rubbed on the skin for skin ailments. Be reminded that you should always test essential oil by using just a drop on the skin to make sure you do not have an allergic reaction. Joint pains affect every one but there are those individuals who seem to be plagued with this condition in more ways than one and would love to treat these pains with natural remedy instead of chemical drugs. This medicinal plant is a good natural herbal remedy for joint pains. The pioneers used it as a blood purifier and painkiller, especially for pains in the joints. It is also used for arthritis, rheumatism, fevers and asthma. Dried fruits and grains added to the bark will prevent it from spoiling and will keep away insects. When combined with sarsaparilla it is very effective also for chronic rheumatism, syphilis, as well as skin diseases. Some people use the tea as a spring tonic and as a replacement for milk. The dried flowers are used to make tea and the young shoots are picked in the spring to make root beer. Due to its effectiveness in purifying the blood and to eliminate waste matter from the stomach, then there are those who say it will aid in weight loss diet. It was used to reduce flesh, move fat and mucus from the body, so it is definitely a wise choice to treat obesity. It is good to ward off colds and flu in the wintertime. A combination with cayenne pepper and or lignum vitae, may be used as a tea to remedy arthritis and rheumatism. Sassafras when combined with sarsaparilla is used as a blood purifier.